… one hole, that is, of the country’s “first bespoke fine art mini golf course” on show at the Nova Festival in West Sussex (5th July to 8th July). 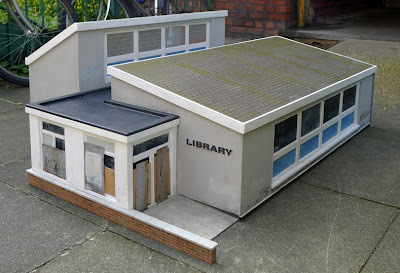 The artist of the incredibly detailed library is Jonathan Allen who was kind enough to answer a few questions from Public Libraries News about this most impressive of model buildings …. When designing the “hole”, was there any particular closures you had in mind? Not really..I’m mindful of the tragedy of any library closing, since it usually represents not just a loss of potential learning, but also the loss of another convivial public space in which, as we know, all sorts of cultural activity can flourish and be imagined. 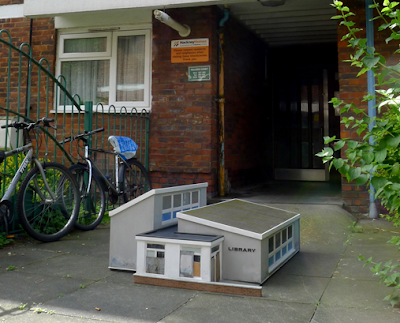 One space which I have been watching near to where I live is the Dorset Library (London E2 7QX), currently closed for ‘health and safely reasons’ . I don’t know the full story of this space but its location at the foot of, and part of a huge council block is significant and interesting. It’s also circular which is nice. My project was also partly inspired by another artist colleague who you may already know about..the performance artist Annabel Other, head librarian of the (much under-acknowledged) Bristol Art Library. See here for more info: http://en.wikipedia.org/wiki/The_Bristol_Art_Library I wrote about her library many years ago..see here: http://www.jonathanallen.info/tbalinfo.html . 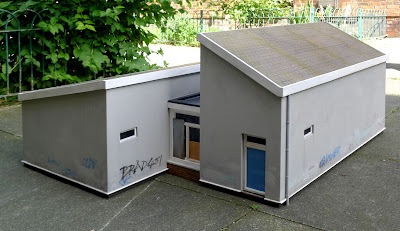 Her project was a response to the closure of Bristol’s Art Library in the late 1990s. Have you used public libraries? If so, what was their impact on you? My whole life I have used public libraries, and indeed any library i can find. Now that I’m based in London, the British Library is my main port of call for all manner of research, and its has served me not only for the expertise and collections contained therein, but as a space where I can just be with people, in the simpler but no less important communal sense. As we all know, there is an incredible sense of belonging in libraries, even for those who haven’t actually come to seek out specific knowledge. My particular love is the rare books and music reading room at the BL where can be found many readers gazing at musical manuscripts. I don’t know why this should be so but its somehow easier for me to imagine music in the mind of a reader than words… there is lots of music floating around the silence of that room for me. In terms of practical impact on my own work, the BL and other libraries simply grant me access, in a highly conducive environment, to information that is often impossible to access elsewhere at the particular time when it is required. Timing is often of crucial importance for projects, as any researcher will tell you. More generally…I used to work with unwell ex-steel workers in Sheffield in the 1990s and one of them (Lockwood Green) said to me once..’With a library ticket, you can travel from the North Pole to the South Pole’. I think that sums it up nicely. Was the model of a particular library? I’m hesitant to tell you this, since I don’t want to tempt fate! 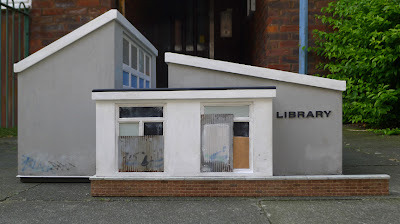 But yes, the visual design was loosely based on the most westerly (‘left’) public library in Britain, at St.Just. If the current administration manage to put pressure on St.Just, then all hope is lost! But it should be emphasized that this was just a design template, as well as a library that I had just happened to pass nearby on a New Year’s break a few years ago, and caught in a holiday snap. St.Just library seems in good health, as far as I know, and I’m unsure of the political situation down there, or the policy regarding its future. 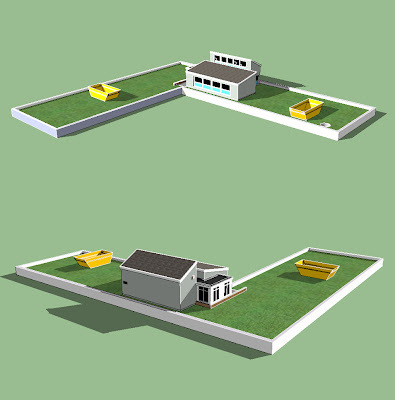 I was really looking for a generic 1970s building that everyone would recognise as civic library architecture. This is also the kind of library I used as a child, and where I learned to love words and the way they are captured together in meaningful groups in books. What is your response to Ed Vaizey, the minister for libraries, talking recently about “the thriving library service that we have in England”? Well you only have to speak to library staff and readers to know that this is a fantasy. What gets me is the amount of ‘creativity’ that is actually required to be so negligent. Destructiveness is usually the word used in this kind of context…’current policy is destroying long-worked for institutions etc etc’, but it must not be forgotten that it takes considerable creative effort to sit down and plan to de-assemble structures that have existing potential for growth, and existing cultural vitality. I suspect that bleeding libraries of their lifeblood is ideological at heart since informed citizens congregate to form an active and potentially hegemony-challenging citizenry. As for the Arts Council taking up the reins of libraries…we’ll have to wait and see. But not recognising the independent knowledge-base of librarians and their institutions, and firming up a Library Council, seems misguided. As for artist’s working with libraries..well, I’d encourage money going to artists any day, but not at the cost of the wider basic funding support of public library’s per se. Yes, technology is changing things a lot (Sven Birkets, The Gutenberg Elegies is good on the difference between book and screen), but libraries and the knowledge of librarians form a very specific cultural quality that should be cherished, valued and built upon. Otherwise, its Fahrenheit 451 ahead! 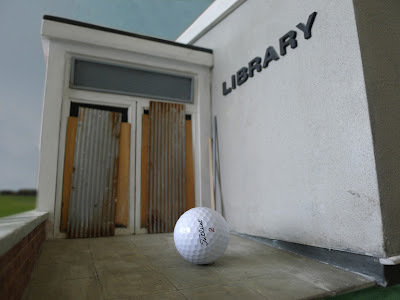 The model library will be part of a playable Crazy Golf course at the Nova Festival, Bignor Park, Pulborough in West Sussex from 5th to 8th July 2012. 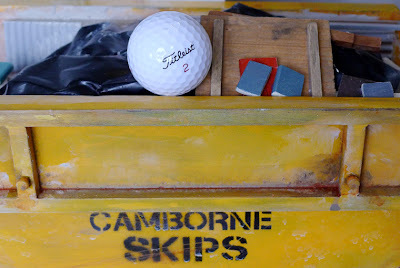 See also Observations: Sculptors in full swing as they tee up a crazy golf course – Independent (28th April 2012). Print article This entry was posted by Ian Anstice on June 29, 2012 at 8:48 pm, and is filed under Uncategorized. Follow any responses to this post through RSS 2.0. You can skip to the end and leave a response. Pinging is currently not allowed. Really brilliant post and such a wise and insightful chap.